Yarn: Cascade 220 and Knit Picks Merino Style (stashed odds and ends, unknown colors), 2.2 oz. total. Pattern: Inga, by Sheila Macdonald , altered to be smaller. Here’s the altered version with the unaltered green version. It’s a lot smaller! Merino Style, the red, is DK weight, so the gauge changed a little. Beyond that, I changed the pattern a bit so that the hat was shorter. The original is 10″ tall and I chopped 2″ off that for this version. I started with 2 braids instead of one (they’re just nice) and changed the stripes a bit. The original stripes are better, so if I had to do it over again, I wouldn’t change them. I then skipped rows 9-23. Easy peasy, shorter hat! It’s sock time over at the Ravelry Stranded group (you need to be a Ravelry member for the link to work). I got my hands on some Rauma Strikkegarn and boy, howdy, do I love it. It’s 3 ply, DK weight, woolly and strong (code for Mr. HelloYarn will need his hats lined) and raring to go on socks. I’ve been poring over my sock books and think what I need to do is make knee high Norwegian stockings, but in so many colors that they could pass for Turkish. First, I have more Selbuvotter knitting, my Tomten is *thisclose* to being finished (just a button band and buttons), and a sock pattern needs to be decided upon. Wow, the colors are fantastic. Great job! It looks great. I thought of making the one for my daughter shorter, but stuck with the pattern for my first shot. What great hats! I especially love the blue and red version. They’re both gorgeous, wonderful hats. Wow! Now here’s another thing I’m wondering about that yarn, the Rauma Strikkegarn or however you say it…the website says it knits at 6sts/inch, but will you knit it at a tighter gauge? Okay! Thanks! I absolutely adore those hats! 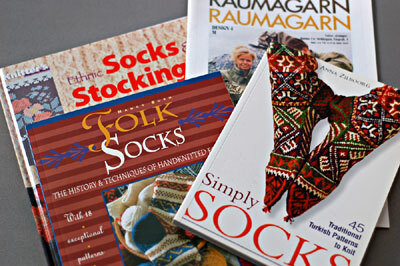 And I love your idea of making Norwegian stockings in Turkish colors…can’t wait to see what you come up with! i think these two hats are great. i’ll need to make one. The hats are so cheery and beautifully done. I love those tiny little specks of orange and red accents in them. 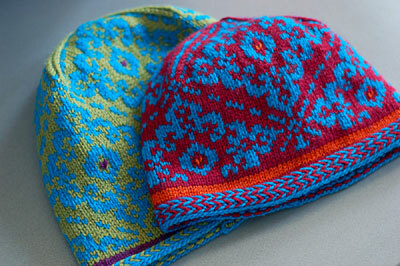 Absolutely gorgeous hats, in the happiest of colour combinations! So very uplifting during these dreary days of winter. Ooooh, those are so cute! The colors are great. Super job. I might have to add another pattern to the ever growing list! :) I can’t wait to see what you come up with!!! 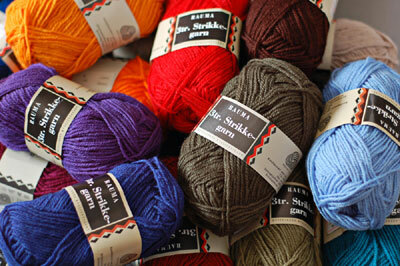 I really like your double braid short version of Inga – beautiful colors too! Can’t wait to see those socks! I need to get going on some stranded socks for Jan/Feb too, but I seem to be hooked on mittens! I aspire to stranded knitting. GOrgeous as always! Wowza, I lurve those colors together. On both hats, as anything lime green or turquoise draws my eye – but I love the vividness of the shorter hat. Boy, I tend to not knit colorwork or fair isle of any sort but these hats shove me out of my comfort zone and into my queue on Ravelry…. sigh. Why won’t they let me knit all day at work? Pesky bosses. I love the hat. What a fantastic job! great hats and those books looks lovely. . remember my dad having socks like the turkish. i wonder if they are still in his closet because then i will have to nick them. The hats – both versions- are beautiful. Just went over to Ravelry to queue the pattern. Thanks for sharing your finished pics! I’m a stalker from way back. I just wanted to let you know that you’re a hero of mine. You design and knit and spin the most awesome stuff. Anyway, I wanted to tell you that I sort of kinda adapted the Pirate mitten for a headband. I’m going to put it up on my Ravelry FO’s when I’m done. It’s a present and the Pirate mittens are being knit to go with. Thanks so much for the terrific pattern. I love your all of your fair isle projects. Very inspiring. 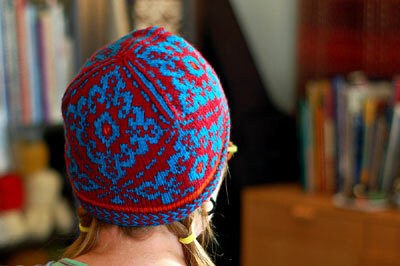 I am really liking the double braid on the second Inga hat. I will remember that next time on my second hat. Oooh! I love what you did with those gorgeous bright colors! Seeing your FO’s has catapulted the Inga to near the top of my project list. Right now, though, gotta work on an original cable-y hat for the next issue of the zine…. so i’m making one of these hats right now. and it is a fun knit. but my edge rolls. what gives? i doubt it’ll be a problem when on the head but when you said that the edge doesn’t roll i was wondering what i might have done differently. I used to work at the Rauma factory for more than 8 years, and it took me almost just as long to knit up all my stashed goodies from the outlet store. Have to make a new trip soon I think :) It’s only an hour from where I live. Wanna join me? ?